New York Vacation Club is pleased to announce their New York Pass Giveaway. Users have a chance to win by submitting their favorite New York vacation stories and photos. The winners are awarded 2 Free / 2 Day New York Passes. It’s a bit like an ‘all you can eat’ buffet…the New York Pass “smart card” works like a credit card with a small computer chip inside which allows our customers complete cash free entry to over 55 New York tourist attractions. New York Vacation Club is an independent Guide for travelers and New York City tourists. The various City Pass programs are specifically designed to save travelers money and offers discount entry or admission into the most famous landmarks and New York City attractions. The New York Vacation Club’s Giveaway encourages users to submit their unique New York vacation reviews, stories, experiences and photos for a chance to win 2 Free / 2 Day New York Passes. The New York Pass remains the best attraction pass for New York tourists offering unrestricted admission to NYC’s top attractions. 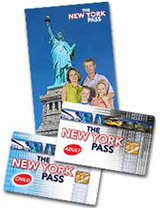 Part of Go City Travel, LLC, has been reviewing New York attraction passes since 2006. As a leader in New York tourism products, our goal is to become a leading authority on attraction-based tourism products in New York with a focus on educating people for smart buying decisions when traveling to New York City.